“Our fight to lift up a million Iowans didn’t end when the polls closed,” said Cathy Glasson last night, when she conceded her race in the Democratic governor’s primary. These words embody all that we at Iowa CCI Action believe. Cathy knows our fight is much bigger than one vote, or one candidate: it’s about never giving up until ordinary Iowans get a permanent seat at the table, one that can’t be bought or sold. Our fight is about an end to phony-baloney politics as usual – in Iowa and across the nation. This is movement politics. Cathy gets it: she’s one of us. And like us, she’s in this fight for the long haul. We couldn’t agree more. We know the change we need starts and stops with us – the people. And we build power from the ground up, with movement candidates like Cathy who dare to step up and demand our seat at the table. We know, too, that this fight has just begun. So we’ll continue to marry our political strength with community organizing power so we can put the people front and center, where they belong. We met Cathy around ten years ago, during the financial crisis, when she was an intensive-care nurse in Iowa City. She stepped up to fearlessly lead her fellow hospital workers in Local 199 of SEIU, and joined us in the streets time and again to take on Wells Fargo and other banks that put thousands of Iowans’ jobs, homes and farms on the chopping block. Since then, Cathy’s always been at our side – so we know she’s as good as her word to continue this fight. That’s why we were excited when she entered the governor’s race. We did all we could to support her, knocking on thousands of doors, holding town halls and issue forums so voters could meet the candidate all across the state – in Mason City, Grinnell, Waterloo, Dubuque, Davenport, Cedar Rapids, Des Moines, and Ames. Last September, right after we announced our endorsement, Cathy got on a bus with us to visit a Burger King that had fired its workers for going on strike. You’re not going to find a lot of candidates who’ll stand shoulder to shoulder with working people in a bank lobby, fast-food restaurant or public office in this way. And Cathy goes way beyond showing up at a rally: she’s been equally fearless in fighting for workers’ right to organize, clean water, a $15 minimum wage, a moratorium on factory farms, and universal, single-payer health care in Iowa, right here, right now – not waiting for Washington to take action. And that’s why she gained the support of tens of thousands of Iowans, who knew she has their interests at heart. Unlike Fred Hubbell, the insurance-industry exec who won last night, she didn’t have family millions to spend on TV ads across the state, or a last name Iowans recognize because they have to write it out on their rent and mortgage checks every month. Iowans know our fight is not about left or right – it’s about right and wrong. And they know which side we’re on. At Iowa CCI, we’ve been organizing for ordinary people for more than forty years – in 1977, we won housing agreements that put more than $30 million into both urban and rural areas across the state. In the darkest days of the farming crisis in the 1980s, we helped family farmers negotiate with banks to restructure debt and hang onto their land. It’s no coincidence that Mills County, where many of these family farms are, voted for Cathy last night. Some of our fights have changed: in the 1980s, we took on the big utilities to negotiate better rates for farmers. Now we’re fighting to make sure Iowans, not investors, reap the benefits of our state’s renewable energy, and that utilities don’t sell off excess capacity out of state so they can pocket the profits. Along the way, we’ve saved consumers close to a billion dollars. But the stakes, and what ordinary Iowans want, haven’t changed: to get a government works for them, and an economy, food system and a farm system that serve the people, not corporate interests. This was the biggest electoral fight we’ve ever taken on: we showed what it looks like to run a different kind of campaign, one that is bottom-up rather than top-down, and that puts real people into the center of our political system. And it paid off: along with the Cathy campaign, we set the terms of the race. We forced every candidate to talk about the issues that matter to everyday Iowans: clean water, healthcare for all, and living wages. And has we look towards the general election in November, we’ll make sure we hold every candidate accountable. 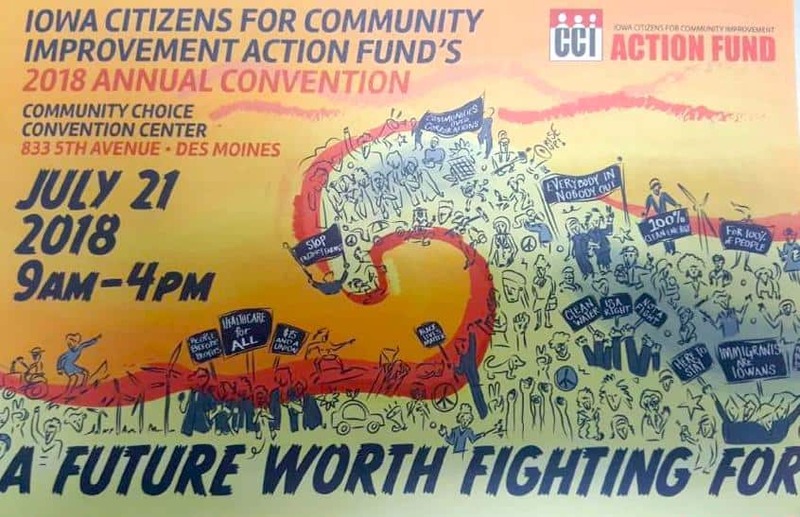 The important work begins now: join us at CCI’s statewide convention on July 21, where we will decide next steps to gaining power that works for all of us. The political establishment expects Cathy supporters to fade into the woodwork. We have to show them that we aren’t going anywhere. Who Will Hillary Clinton Stand With? When push comes to shove, will Clinton merely reshuffle the deck? Or will she stand with everyday people and go toe-to-toe with the corporate and political elite to fundamentally rewrite the rules of the game? Hugh Espey has been executive director of Iowa Citizens for Community Improvement since 2003 and an organizer in Iowa since 1979. He's also a lifelong St. Louis Cardinals fan.